The Staging Point » Blog Archive » Why Are Gary Gygax’s D&D Modules Still Unavailable? Why Are Gary Gygax’s D&D Modules Still Unavailable? Posted on March 5, 2012, 11:35 pm, by Andy, under Culture, D&D, Rant, Retro Gaming, Roleplaying. The cover of "Keep on the Borderlands," perhaps the most famous and influential roleplaying adventure ever published. I’m really glad they’re bringing back, even if just for a limited print run, some vintage D&D books. But as cool as that is, it also reminds me how crazy it is that almost all of Gary Gygax’s most famous and influential work is out of print. Long out of print. 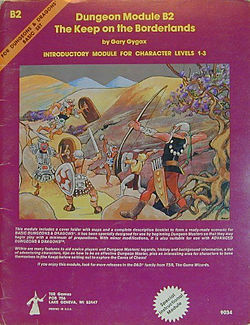 In addition to the assorted early edition D&D rulebooks, Gygax authored some of the most influential, fondly-remembered, imaginative adventures and campaigns: The Keep on the Borderlands, Tomb of Horrors, The Temple of Elemental Evil, the “Against the Giants” trilogy, and oh, about a bazillion others. All of those are gathering figurative dust in Wizards of the Coast’s basement someplace, instead of being available to gamers or civilians who want to delve into the history of the roleplaying hobby. From a gaming perspective, the craziness of keeping the hobby’s greatest hits out of circulation for decades is obvious. And from a non-gaming perspective, it’s odd that, given Gygax’s influence on pop culture and the attention his death received by mainstream news outlets, none of his defining works are available. 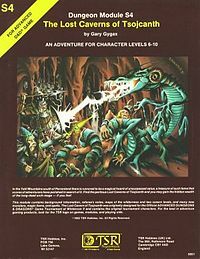 As anyone who’s read or played those old modules will tell you, Gygax’s voice and writing style are incredibly unique; it was in these adventures and campaign modules that his quirks as a creator and visionary were truly apparent. I don’t think it’s an exaggeration to say that there’s real literary value in keeping his early D&D works available. More Gygaxian awesomeness in "The Lost Caverns of Tsojcanth." The limited reprint of the AD&D rulebooks is a promising sign, as are the promises that the upcoming 5th edition of D&D will somehow bridge gaps between the various editions of the game. And maybe if the AD&D reprints sell well, we’ll see an anthology of Gygax’s greatest adventure modules follow. With the rising popularity of ebooks and the maturation of print-on-demand technology, there are many ways a creative publisher (I’m assuming it’s Wizards of the Coast, but Gygax Games might or might not have some say in the matter) could make Gygax’s work available to modern readers without a massive financial commitment. Here’s hoping. Andy, if you really want one, I can try to dig the Keep out from my stash of “junk”, along with a not-too-battered “Basic Set”, vintage mid-80s, the next time I visit my parents. Hope all of you are very well! Hey KDC! Long time no see, eh? Hope you and the family are well. My post wasn’t motivated *entirely* by my own desire to own these Gygax modules, although that was certainly some of it 🙂 A quick glance at Amazon shows that copies of “Keep on the Borderlands” are going from $7 – $215, so I’m guessing the condition of your copy will be pretty key to determining the market value….